This page provides an overview of my activities as part of the e-Learning Community Co-ordinators project, a professional development initiative at Unitec Institute of Technology. Met with the Department of Education post-graduate programmes team to identify elearning needs and professional development strategies. Facilitated a 1.5 hour face to face Intro to Moodle workshop in computer lab with post-graduate teaching team. Facilitated a 2 hour face to face seminar for Department of Education staff on Social constructivism and Moodle. Facilitated a 1 hour face to face discussion with post-graduate teaching team on Planning for 2001. We now have a simple Moodle template that is easily re-usable and customisable. All new courses in the post-graduate area will use this template as a starting-point. Lecturers will be encouraged to consider external tools such as wikis, blogs and social network tools to complement the resources and activities within Moodle. 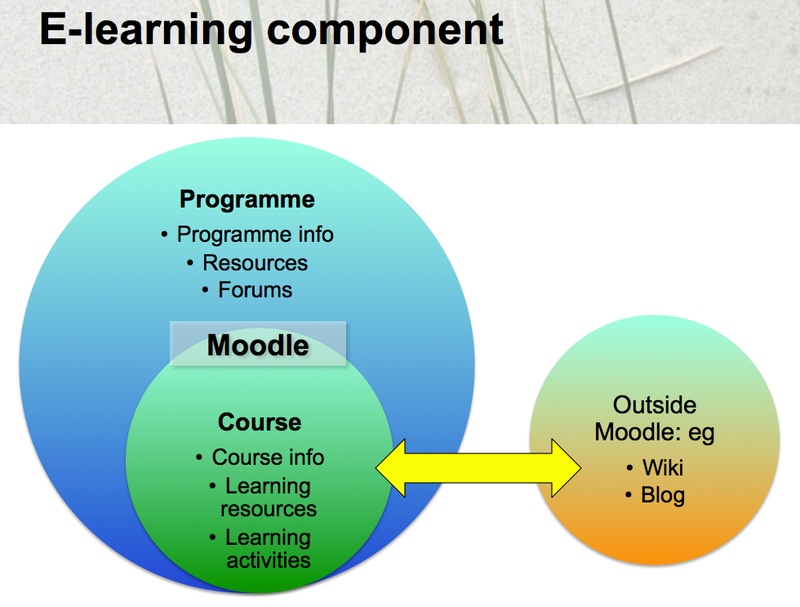 For most lecturers, Moodle is a substantial first step and the incorporation of external tools is likely to be appropriate from 2012. In a series of planning meetings we have developed a structure of meta-courses to avoid unnecessary duplication of resources and activities across individual courses, and to encourage interaction between participants in all courses in a programme. Many courses will have two meta-courses. Online support through Moodle presence.